Growing up in a traditional Lebanese home taught me the value of a great home cooked meal but limited my food experience to the local Mediterranean cuisine. It wasn't until my late teens that I started putting aside my preconceptions about flavors and experimenting with recipes. 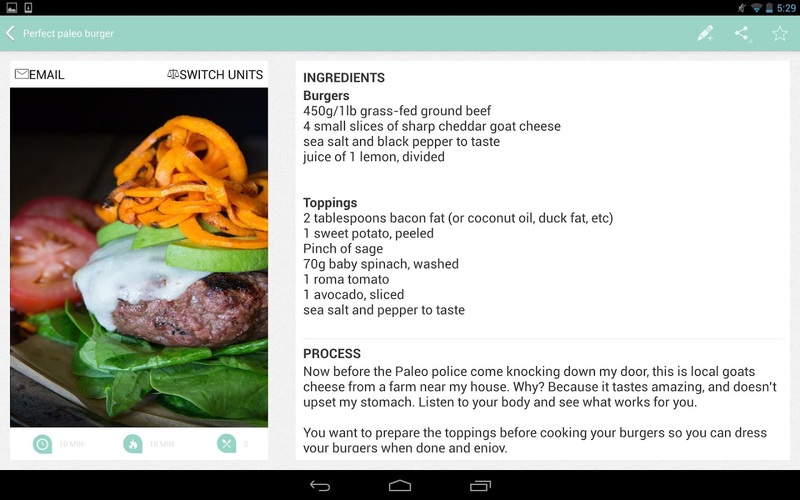 Nowadays, whenever I feel the need to do some creative cooking, I head into the kitchen with my Nexus 7 in tow. 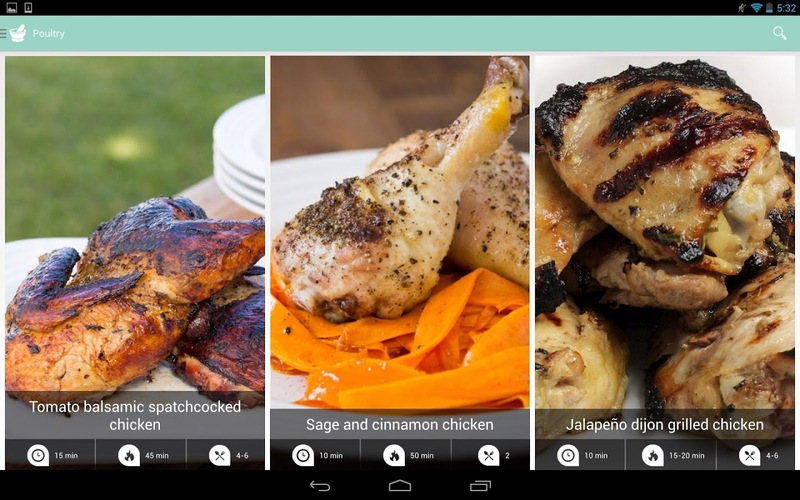 It houses twelve excellent recipe apps optimized for tablets, with some of them specifically designed to be used during the cooking process. Whether you're looking to start your culinary exploration or to enhance your skills, you should first check the Food Network. Despite having a commercial feel, the network houses great chefs who often present interesting ideas. 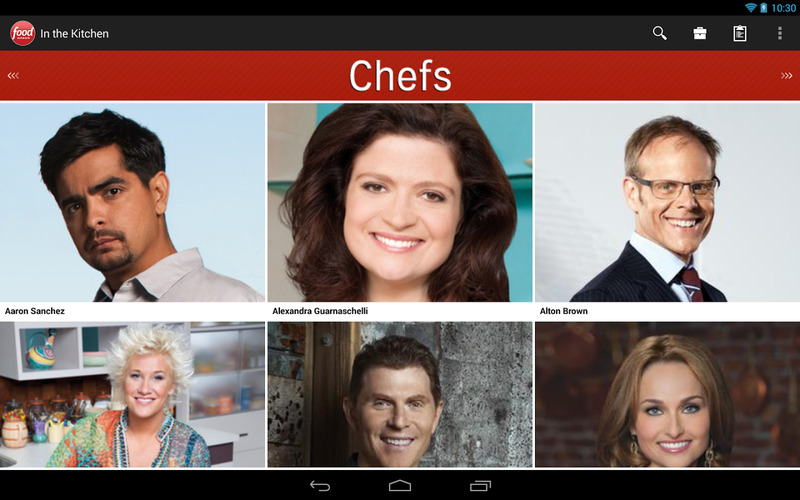 From Giada De Laurentiis's sophisticated Italian flavors to Guy Fiery's anything goes approach, there's bound to be something to satisfy your taste, and that translates well into the network's In The Kitchen app. 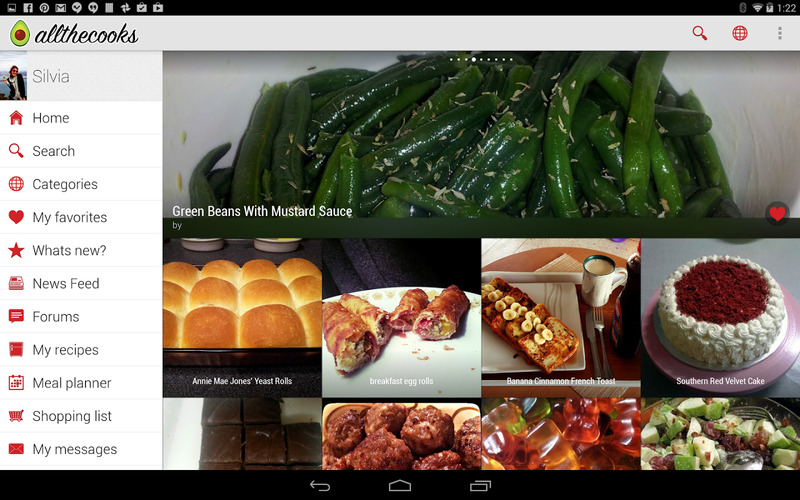 With three ways of browsing for recipes (aside from searching), In The Kitchen makes it easy to find your inspiration. 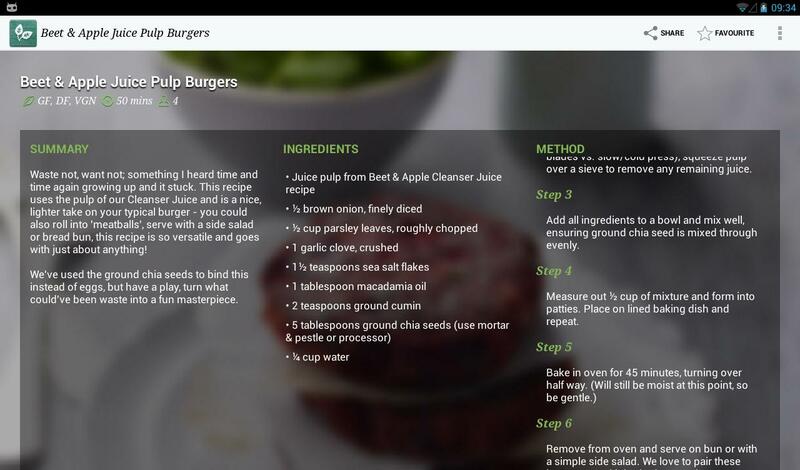 The "Chefs" section lets you quickly check recent and popular recipes by your favorite cooks. 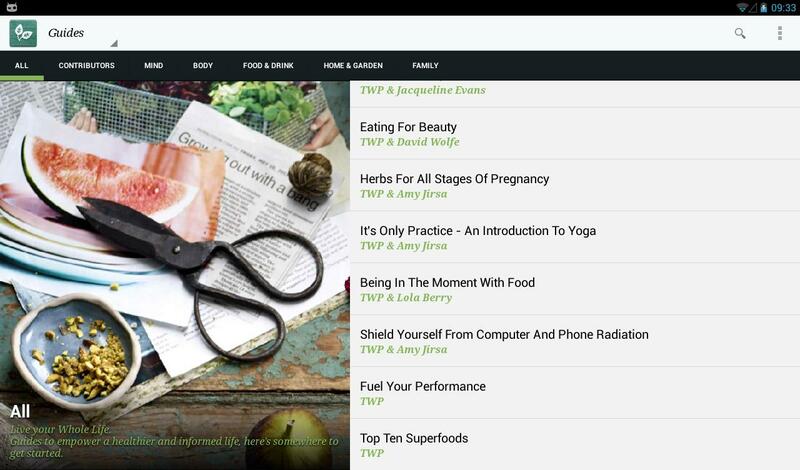 The "Topics" area is a mix of recipe groups including meal types (appetizers, desserts, sandwiches, and so on), cuisines (Italian, Mexican), and even specific dietary requirements (healthy, vegetarian). A third section varies by season and occasion. It is now focused on "Spring Entertaining" with collections of produce-friendly salads, treats, and dishes. 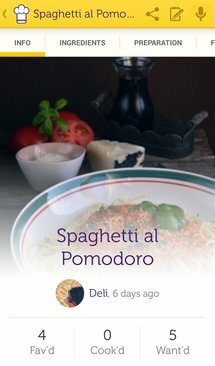 Every recipe in the app is presented with an information card containing a beautiful image, difficulty level, yield, and duration divided into preparation and cooking times. 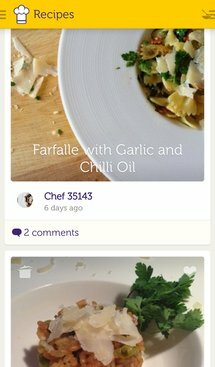 Aside from the traditional ingredients and directions, recipes also carry ratings given by other users and a personal notes tab. Thanks to a recipe box, shopping list, unit converter, and timer, In The Kitchen is designed to be helpful both while you're browsing for ideas and when you're cooking. If the Food Network is the place to go for professional recipes, Allthecooks is the destination for experimentation and ideas from other amateur cooks like you. There, you will find everything from the elegantly presented platter to the barely detailed recipe. Thankfully though, the rating system helps the better meals stay on top and pushes the duds to the bottom. Allthecooks thrives on its social aspect, with three incredibly helpful sections attached to every recipe: reviews, questions, and photos. 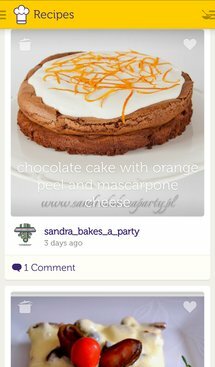 You'll be able to read what the community thinks of a platter, ask and answer any question related to it, and check photos of the same recipe cooked by several other users. As a member, you can also favorite recipes, post your own, and follow specific users if you like their culinary style. Allthecooks doesn't mince on traditional features either. Prep time, servings, ingredients, and directions are laid out clearly. The handy convert button instantly switches the measurements from metric to imperial. A meal planner and a shopping list help you prepare beforehand. But Allthecooks adds more thoughtful features like nutritional facts, the possibility to upload and view YouTube videos of the recipe, and a convenient way to search for any ingredient should you be unfamiliar with it. 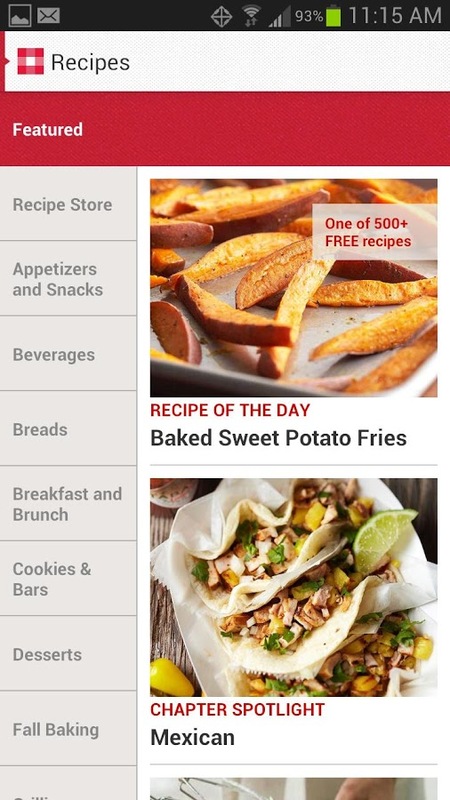 Better Homes and Gardens is one of the most renowned recipe magazines, and their Android app brings more than 500 of its famous and tested recipes for free. 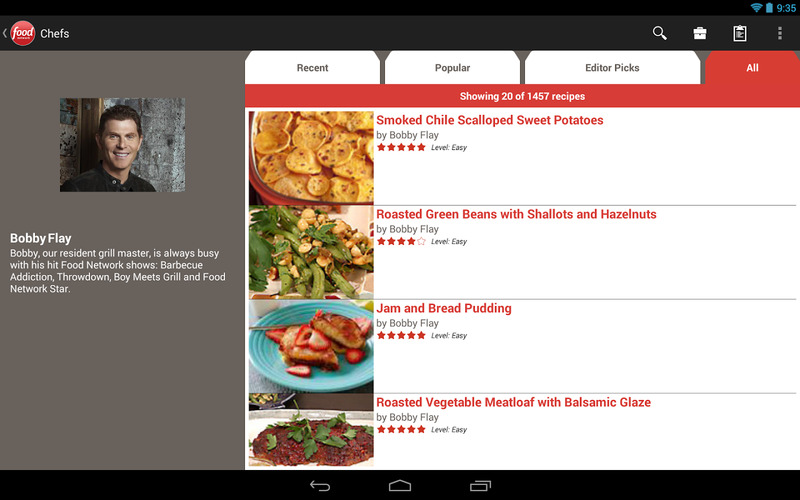 Several in-app purchases of additional cookbooks are available as well. 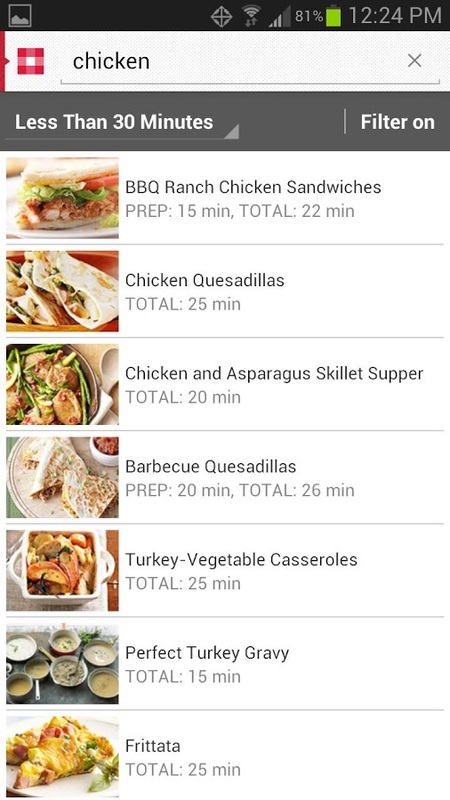 BHG might seem like a basic recipe app at first glance. The only cooking aids you get are a timer and a shopping list. There are no reviews, no options to add your own recipes, no unit conversion, and none of the bells and whistles that you could find in other apps. However, it is full of useful little additions that improve your cooking experience. For example, while browsing the different categories, you can filter by subsections or specific requirements such as healthy, fast, or low-fat. Also, some recipes contain an additional "Make-Ahead Directions" section that explains how to prepare a part of the recipe beforehand so you have to do as little as possible before serving it. Furthermore, many recipe steps contain highlighted parts that link to a photo of the corresponding instruction. And if that isn't enough, BHG has a "How-To Secrets" section with tips and videos of basic and advanced cooking techniques. Cooklet is another community-based recipe app with a beautiful design and a very convenient voice control feature so you don't get your tablet dirty while cooking. The social aspect of Cooklet is well executed with comments, user profiles, follows, and the possibility to see who favorited, cooked, or marked a recipe as wanted. However, it is mostly let down by the small size of the community, especially if you compare it to the behemoth that is Allthecooks. If you keep your social expectations low with Cooklet, you won't be disappointed. The app's selling point lies in its voice control implementation. Almost all sections can be navigated with voice commands, allowing you to jump between ingredients and instructions without touching your tablet. 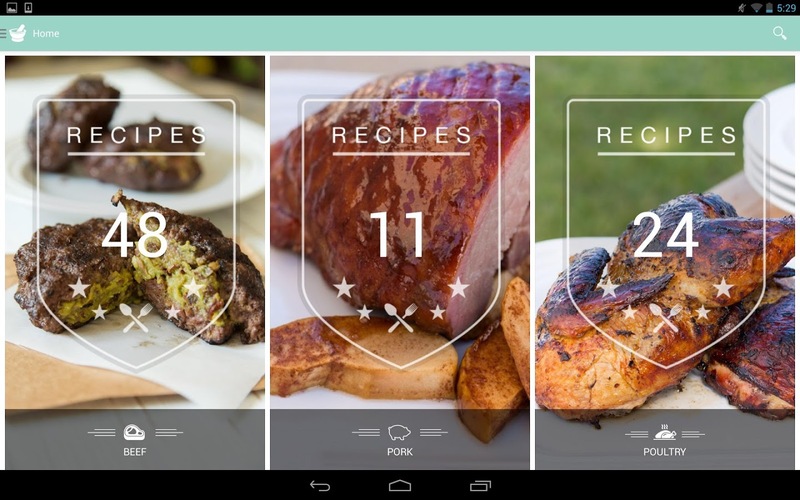 If you start cooking, you can also direct the app to read aloud the steps for you. However, there are a few execution issues. Most annoyingly, I couldn't find a way to get the app to start reading the instructions unless I marked the first step as done. 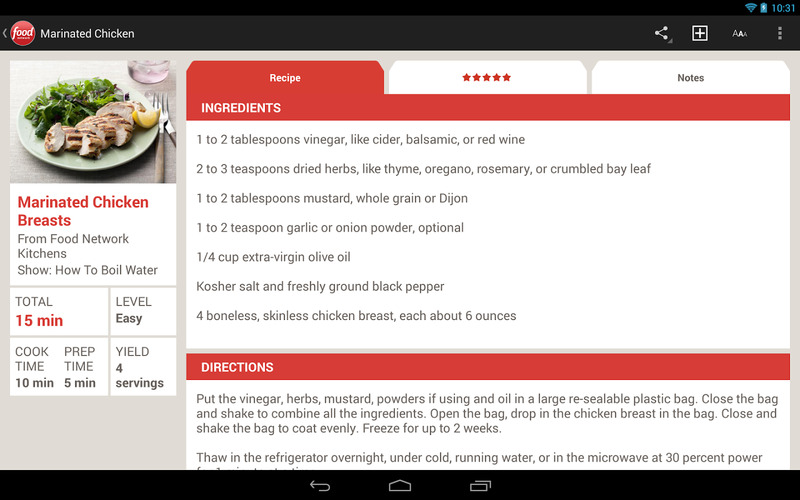 Still, Cooklet is the first Android cooking app I have found that responds to voice commands in the kitchen. That's a useful feature I want to see in all the other apps on this list. While 52 recipes hardly constitute an extensive culinary resource, they do amount to a good cookbook. This is what you should consider The Whole Pantry as: a cookbook in the form of an appetizingly designed app. Also, its premise is a more natural eating style that lacks sugars, grains, and gluten. 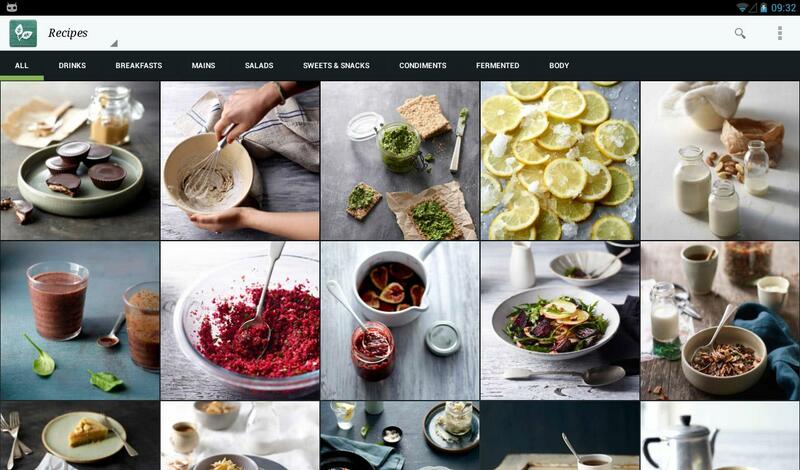 Recipes are divided into tabs with grids of nothing but mouthwatering pictures. Once you select one, the image fills the screen and gets blurred if you reveal the recipe details. These are displayed in three columns: summary, ingredients, and method. Each column is scrollable separately and smoothly. In the header, you'll see the preparation time, servings, and a few acronyms indicating whether a recipe is gluten-free, dairy-free, vegan, or paleo-friendly. The Whole Pantry goes beyond the cookbook approach, adding health and wellness guides along with a list of recommended reading. Its only downside is that the app's description promises monthly updates, yet the last version dates back to February 2014. If you decide to purchase The Whole Pantry, keep in mind that you might have to live with it in its current state indefinitely. Based on the paleolithic diet, Caveman Feast carries the same spirit and approach of The Whole Pantry. At 200+ recipes, it has a bit more meat in its virtual pages, but it still feels like a cookbook in an app, a deliciously designed app nonetheless. Caveman Feast is divided into eight sections presented with a succulent cover image and overlaid with the number of recipes in each. Inside every section, recipes follow the same layout of beautiful photos and transparent overlays of titles and descriptions (preparation time, cooking duration, and servings). Once a recipe is opened, you'll see the ingredients and process. 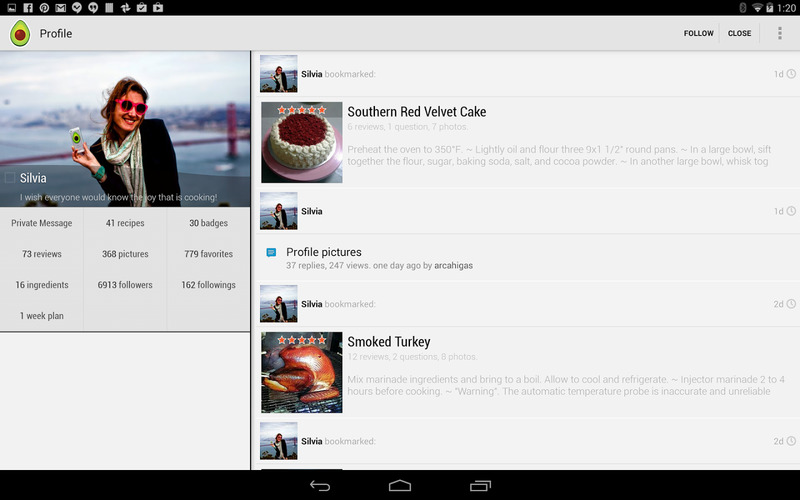 You can also favorite recipes, switch measurement units, or check the comments online. As far as recipe app features go, Caveman Feast is limited, but don't let that fool you into dismissing it. It contains many unexpected mixes of flavors, but manages to keep them healthy yet succulent. All I can add is that it has a chocolate bacon bites recipe. Let that sink in for a second. 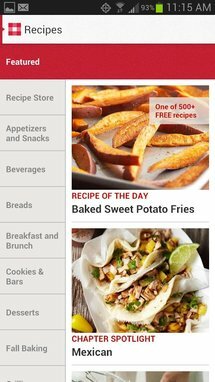 BigOven: 250,000+ Recipes: It's one of the few famous cooking sites that has kept its app updated regularly. 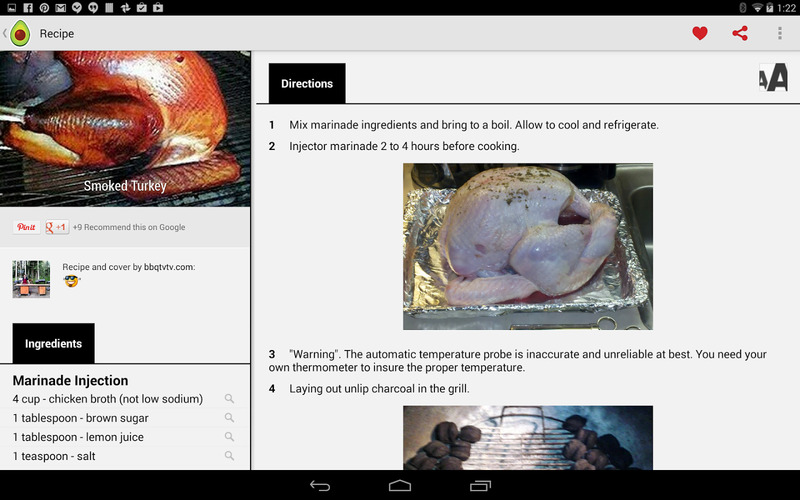 Full of features and containing recipes from various other sources as well, BigOven would have been excellent had it been optimized for smaller tablets like the Nexus 7. 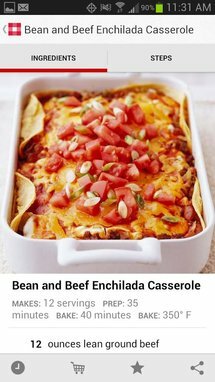 Pinterest: While not a cooking app per se, Pinterest is a beautiful way of organizing recipes you come across while browsing. If you are too lazy to find recipes on your own, you can also follow other users collections. Evernote Food: Needless of an introduction, Evernote Food is another excellent way of collecting your online recipes. 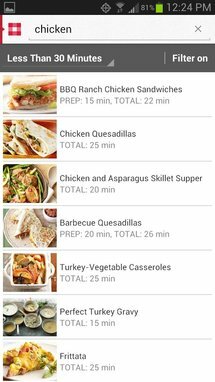 Paprika Recipe Manager: Paprika is an iOS and Android recipe manager that starts with a blank slate and lets you import recipes from online sources or add your own. BBC Good Food - Recipes: With plenty of cookbooks for different occasions and styles, Good Food is a fantastic recipe application. Its downfall is that it only works in the portrait orientation. 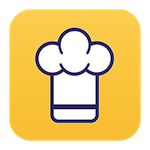 Cookbook - Beautiful Recipes: It's a superbly designed app that is let down by its tiny collection of recipes and limited features. Recipe apps may not be Android's forte, with several famous services releasing an app and abandoning all development shortly thereafter — I'm looking at you, Epicurious, Allrecipes, Betty Crocker, and Pepperplate. However, if you spend some time searching for better alternatives, you can easily find modern and gorgeous cooking applications that work just as well on phones and tablets. Some are quite powerful like Allthecooks, others are very specific like Caveman Feast, but all of them should come in handy if you plan on cooking your own creative meals.